Where on earth did August go? Methinks it got lost amongst all the book releasing, catching up with friends & family and travel madness. Already we've travelled our long journey to Italy and settled into the double decker. There's so much to share about our adventures over the summer; workshops and trunk shows and weddings by the seaside and get togethers with old friends sorely missed while we're away. Firstly though, I'll catch up on some book and design news. Bambeanies has been getting lots of positive attention since it's release, and for those of you who prefer a print copy over the PDF can now get yours on Amazon.com. And if you've already got your copy and loving it, a review would be muchly appreciated! Reviews can make a big difference, especially for those not already familiar with my work or website. The book gets onto Amazon.com quickly as it's printed through CreateSpace - it can take up to 6 weeks to filter through to regional Amazon's, as they aren't all as related as you'd first think. UK yarn shops will soon be able to get their copies through my UK distributor, as they have a large batch winging it's way across the Atlantic as I type. US and other overseas yarn stores can also order the book wholesale - all the current specs can be found on the Wholesale page. A blog tour has just started, and I'll update the page with all the details as soon as possible (I did say we'd just driven 1500km, yes?) There are also lots of reviews coming from many wonderful places too, which is all very exciting. Other design news: As well as completing 3 new secret designs this summer for publication (!) and a bunch of single designs due for release later in the year (busy, much?) there's also a brand new design just published! 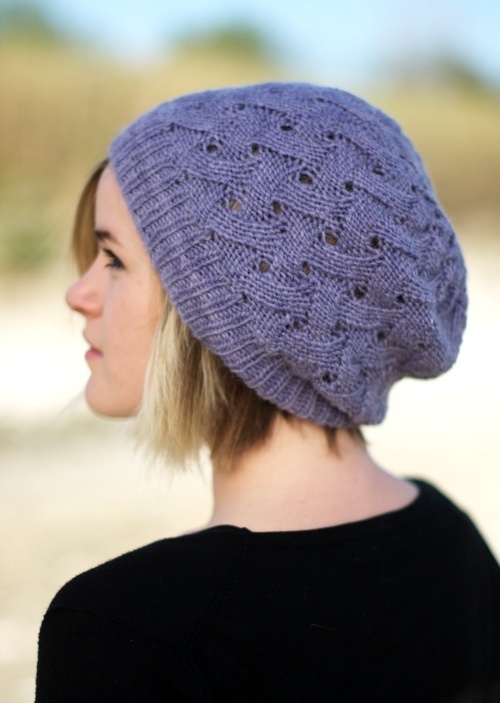 QL Slouch is a fully reversible slouchy lace Hat. It's our September KAL pattern in the Ravelry group, so please do come and knit along with us. It's knit from the Natural Dye Studio's gorgeous Queenies Love. It is a limted edition yarn, yet they have others which are a great match for yardage and drape. All that's needed to make this Hat reversible is careful weaving in of the ends - that's it. It's knit in the round and bottom up, and it's knit with the stocking stitch side (above) facing, to avoid too much purling. Once done, hide your ends, block, and then wear whichever way you prefer! The pattern comes in 3 sizes, and is easily customisable should you wish. Full charts are included, as well the written directions, suiting all knitters. It's a pleasant, easily memorised stitch pattern and is perfect for on-the-go knitting. What's not too love? I'll be back soon with more things to share, promise. Meantime, enjoy Bambeanies & QL Slouch! Newer:Shaping Shawls - an Interview with Anna DalviOlder:Bambeanies is published!